BATTLE CREEK, Mich. — Kellogg’s is launching three delicious snack innovations packed with even more flavor and texture than ever before. 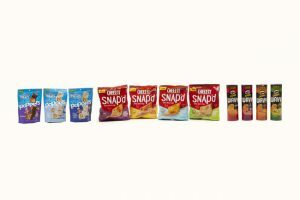 Made to satisfy your craving no matter the occasion, the new offerings from some of Kellogg’s most popular brands are Cheez-It Snap’d, Pringles Wavy and Rice Krispies Treats Snap Crackle Poppers. Cheez-It Snap’d are a thin, crispy and munchable snack made with real cheese inside and out for big cheese flavor. Cheez-It Snap’d will be available in the following flavors: Double Cheese, Cheddar Sour Cream & Onion, White Cheddar & Bacon and Jalapeño Jack; all marrying cheese with other popular snack flavors. A new twist on the iconic Pringles Original crisp, Pringles Wavy boasts a thick wavy texture to deliver a bold crunch and big flavor in every bite. The complex flavors are inspired by grilling and include Fire Roasted Jalapeño, Classic Salted, Sweet & Tangy BBQ, and Applewood Smoked Cheddar. And finally, Rice Krispies Treats Snap Crackle Poppers are ooey, chewy, bite-sized Rice Krispies Treats coated in a smooth, silky topping. The delicious flavors include Chocolatey, Vanilla Crème, and Cookies ‘n’ Crème.